Kumomi Onsen (雲見温泉) is located in west-side of Izu Peninsula, Shizuoka. 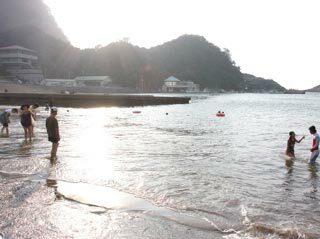 It is very small town, but has great Onsen and beach which has great view of Mt. Fuji. Also, there are many hiking courses you with Japanese flowers of all season. In summer, many people visit here and enjoy at beach and stay Onsen Hotels, and some of people enjoy camping. Also, there are many natures you can enjoy, such as Mt.Eboshi, Sengan-mon rock gate. Swimming, scuba diving, fishing, and fishing. There are many Onsen Hotels you can enjoy. Also, Free Ashiyu (foot onsen) at beach is available. One of the best beach to enjoy Mt. Fuji at beach.